Yaga Baba’s chicken-legged house. Samus Aran’s various ships. Howl’s moving castle. Warframe’s Liset. Anthem’s striders. Sometimes, heroes need to take their homes with them. How many of you installed a bed, lavatory, kitchen, and workshop into your Chariot of Aerial Conquest? Or made a creature of Legendary Size your familiar just so that you could build a permanent, habitable howdah on its nigh-oblivious back? Taking any one building from a city and making it a mobile one is always pretty awesome. I think it covers the airship trope without needing the airship well enough, and csn bridgr the gap between 'nameless wanders going from village to village' and 'protect my hometown at all costs'. An extra buffed yeddim or some supernatural beast of burden would do well (Netflix anime Seven Deadly Sins does it well with their mobile bar). It definitely gets more epic than your average merchant's wagon. Sidenote: i had to make sure this wasn't some weird picture of a solid gold rv or trailer hitched mobile home. Though an indestructible Artifact RV would be a neat way to travel in style into battle. ... I have randomly decided there's a Storm Mother with an ancient hatred for an ancient hearth goddess worshipped by a bunch of nomadic cultures. Therefore, in Creation, tornadoes (Storm Serpents?) do in fact go after mobile homes. Fun antagonist for your PCs! I've consider an artifact "train" that either floats or carries itself on millipede legs. The cars between the engine and caboose are capable of breaking away and forming their own train to run off to safety with their passengers and cargo while the engine and caboose combine into a war machine to stay and fight. The war machine might be a warstrider. There was a demon someone made a while back (I forget where it is) that was an expy of Calcifer, complete with a moving castle. Here, If anyone was looking for it. Thanks for that; I've been looking for it for a while. Thousand comfort lounges are great to have in your wagon/RV/ship's cabin. Breed a catbus in the middlemarches. Remind me what that is? A spell like that Pavilion thing? It was an Artifact devoted to just being a particularly comfy piece of furniture. Their writeup is in Wonders of the Lost Age, if memory serves. A friend of mine's sorcerer has a floating castle where the PCs all live. It has its own sun and demonic guards. 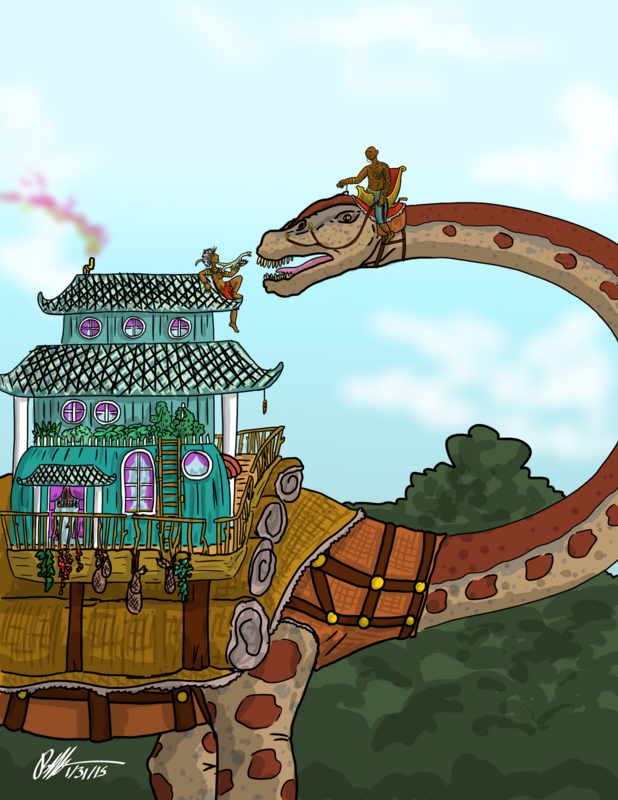 It definitely seems like you could cast Ivory Orchid Pavilion within the bounds of a train car, or part of the interior of the Chariot of Aerial Conquest, or on a platform built upon the back of a behemoth. Fun anecdote: a former co-worker of mine knew people in a tornado-ridden satellite town whose adult child lived in a mobile home on their land. When a tornado hit not only did their house escape harm while the trailer was demolished (of course), the winds ripped the son's mailbox off the shared post while leaving the parents' untouched. Can't get a much plainer sign than that!